$10,000 PRICE ADJUSTMENT! Come Take Look! Don't Miss this One Owner Custom home in Monarch Landing on .37 acre lot. Character and Charm throughout, from the Old World Shutters, Stone Accented Exterior, Large Front Porch with Pergola to the Designer Exterior/Interior Paint and Lighting. Split Style Ranch w/Vaulted Ceilings, Archways, Gas Fireplace, Luxury Trim/Mantel, Dining Room Niche, Beautiful Hand scraped hardwood floors in Kitchen/Dining. Vaulted Master Suite with Private Luxury Bath. Enjoy Entertaining in Chef Style Kitchen w/Granite Breakfast Bar, Hidden Pantry, Extra Cabinets & Counter Space! Enclosed Main Floor Laundry just off kitchen w/Cabinets/Storage Bench. Newly finished by professionals...$10k in landscaping that includes ornamental trees, high end rock, drip system and lighting. New High Efficiency HVAC system w/Humidifer. Relax on the Covered Deck w/Ceiling Fan & Party Lights overlooking Full Wrought Iron/Wood Fenced backyard w/Sprinkler and Drip System for landscaping. Full View Out Basement Framed w/Electric ran and Tub for your personal finish. Just a few doors down from the Pool and Play Area for the Summer or Build your own Pool/Play Area in the Large .37 Lot! 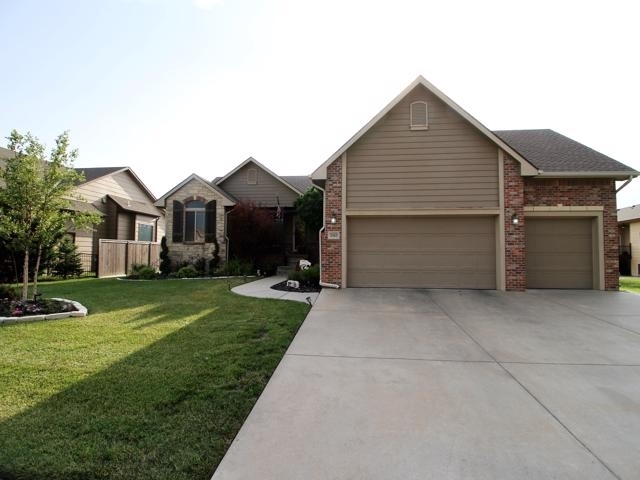 Save on Lower Taxes in Sedgwick County with the highly sought after Andover School System! Walkway directly to Elementary school through Subdivision! Don't Miss this Beautiful Home! Call/Text for your Private Showing!